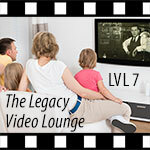 ← Legacy Video Lounge Podcast – LVL 6: Let’s talk legacy video benefits – Pt. 1. In Episode 7 of The Legacy Video Lounge, personal historian and video biographer Steve Pender of Family Legacy Video, Inc. in Tucson, Arizona shares his thoughts on who should save their life stories and why. Steve also touches on some of the benefits that a legacy video project brings to both families and storytellers. Steve begins with a reading from “Like A Library Burning,” by Scott Farnsworth and Peggy R. Hoyt. Steve then describes the following benefits that come with legacy video projects including: validation of a meaningful life, finally telling the full story, energizing mind and lifting spirits, and uncovering little-known or nearly forgotten stories. Steve also shares the results of three university studies that document benefits to storytellers and their families, especially young children.